The AAPE Silver Award of Honor is intended to be presented at local and/or regional exhibitions that are not APS-accredited exhibitions. The purpose of the AAPE Silver Award of Honor is to recognize and encourage exhibitors who have worked hard for excellence of presentation, but who have not been awarded a Gold award at the show. The exhibit may consist of any number of frames. Shows of at least 500 pages of exhibited material are allowed to award two �AAPE Silver Awards of Honor�. If possible, the two awards should be given to two different award levels. In other words, AAPE would like to have excellence in presentation rewarded regardless of the medal level awarded the exhibit. 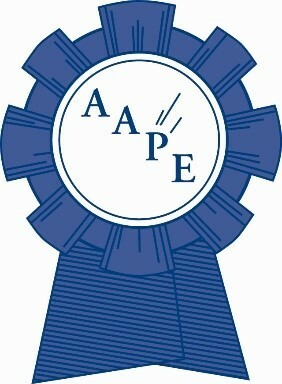 The AAPE Silver Award of Honor is not an award that should automatically go to the higher medal level exhibits. For example, if there are five medal levels, it is possible that a Bronze exhibit and a Silver exhibit each be awarded an AAPE award. The two awards should be presented as equal awards, not as an �AAPE 1st� and AAPE 2nd�. Shows having fewer than 500 pages of exhibited material will be allowed one award. Logic of Progression: How logical is the sequence of the pages in telling the material�s story? Is the material pertinent to and within the parameters set down by the title? Does the exhibit have a beginning, middle and end? Write-up: Is it pertinent, brief and non-redundant? Neatness: Are the pages clean? Is the write-up method neat and tidy? Are mounts subtle and even?